Adam’s successes don’t end there – he’s been featured as a speaker at The White House and named to Forbes 30 Under 30, Business Insider’s 40 Under 40, as well as Wired Magazine‘s 50 People Who Are Changing the World. Read on for productivity tips from Adam! I wake up at around 6:30 each morning and commit to focusing that first hour on human contact rather than contact with digital devices like my phone or computer. We have twin babies, so I immediately go and spend time with them, whether it’s feeding or playing with them, making sure I start my day focused on what matters most, which is my family. After I’ve spent time with the babies and my wife, I then turn to my email and start the work at hand. I use an app called Captio, relentlessly. It’s the simplest and most effective app on my phone. When you open it, it shows a blank note and whatever you type into that note or attach to it will immediately be emailed to yourself and be at the top of your inbox once you hit send. I do this for reminders, to-dos, things I’m excited about and quick ideas. It enables me to capture quick ideas and log them into my inbox but not be overly distracted by my phone. Every night when I go to sleep, I put my phone on airplane mode and in a completely separate room. This is a practice I’ve done for more than 5 years. I’ve found that when my phone is within reach or is able to receive inbound calls and emails, my mind is active and I’ll frequently grab my phone and start down a rabbit hole of emails or internet-surfing that doesn’t allow me to get a good night’s rest. Several years ago I removed email notifications from my phone, so I never see the little red number go off on my mail app on my phone. 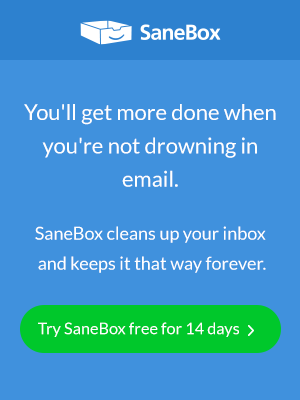 It reduces the ability for an email to interrupt what I’m focused on, but I still probably check my inbox as a habit throughout the day. My guess is I’ll open the app or Chrome tab somewhere between 50-100 times per day. I received feedback years ago from my team that I was constantly checking and addressing email during meetings, so now I put my phone in my pocket throughout meetings and have set up separate vibration tones for calls or texts from my wife or other family members. Otherwise, I do my best to stay completely present for those that I’m in front of. This helps me reduce multitasking that might make me ineffective in addressing what I need to focus on in that moment. I remove distractions as best as I can. This can mean closing down tabs, putting on headphones, or simply going into a space mentally in which focus can be attained. Early on in my career, I found that failing is more important than succeeding in a person’s journey of growth. When you fail at a task at hand, no matter how big or small, the lessons you learn stay with you far longer than celebrating a success does. Pursue your passion. I think passions are fleeting and don’t provide enough motivation to push through the hard moments of any entrepreneurial or professional journey. I tell people to do the hard, introspective work of finding your purpose. Ask yourself what are you here to do with your one amazing life, and once you get to a place of clarity with finding your purpose, you’ll become unstoppable. The lessons in The Alchemist by Paulo Coelho are still as powerful today as when I read the book 12 years ago as an early 20-something traveling the world. There’s a deep and profound wisdom in his words. We actually gifted this book to every student who was accepted into MissionU’s first cohort in the hopes that it’ll be a source of guidance and inspiration for them. Behind every entrepreneur’s success is the undying support of their loved ones. I have an amazing wife and 11-month old twins, and they help remind me what’s truly most important in life. Any moments spent with them always energizes me, and makes the hard work I put into my professional pursuits seem entirely worthwhile. Maximizing time to enable the highest value output in a given day.